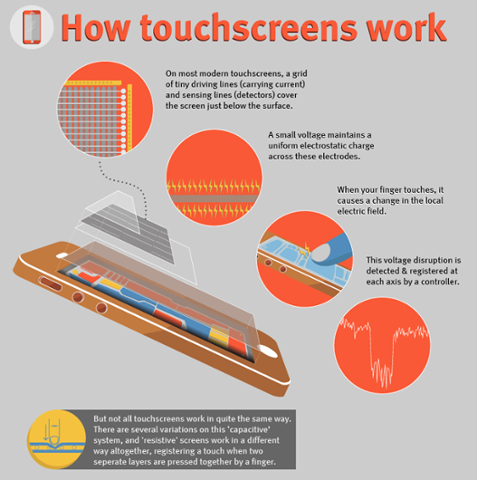 Know anything else you think everyone should know about how touchscreens work? Do you have a knowledge of what's going on behind glossy touchscreen of your smartphone or tablet? There are many multi-touch technology, but the most commonly used are resisted and capacitive. The resistive screens, literally resist when touched and if you press hard enough you can feel the screen bent slightly. This is what makes the resistive screens work. There are two layers in resistive touchscreen. These are separated by tiny dots called spacers. The electric current run through the conductive layer at all-time. When you touch screen, the resistive layer comes in contact the conductive layer making the electric current changes on that point of contact. Finally, the function corresponding on that point is carried out. Like when you touch the certain icon for your favorite apps. Capacitive touch screens are durable and consistent. However, they're harder to read because of multiple layers reflect more ambient light. Ambient light is the surrounding light that reflects back on the screen making the text harder to read. Unlike resistive touchscreen, capacitive screen do not use the pressure your finger to create changes on electrical current. Instead, it work great to anything that holds an electric charge including human skin. Capacitive touchscreen are constructed using materials like copper, or indium tin oxide that store electric charges in an electrostatic grid of tiny wires much smaller than a human hair. There's a glass substrate that conduct a layer, a protective coating, a controller and electrodes on the corners. The electrodes appliead at low voltage that conduct a layer creating a uniform electro-static field. When a fingers hit the screen, tiny electric charges transferred to finger to complete the circuit creating a voltage drop at that point on the screen. A location of this voltage drop is reported by the controller. That is how a capacitive touchscreen works! Anyway, don't get confuse about touchscreen, digitizer or LCD digitizer. Touchscreen, digitizer or LCD digitizer are all the same thing. To end most of the confusion, touchscreen is not an LCD. The LCD (Liquid Crystal Display) is a thin, very fragile and the main source of all images you seen on your device. In short, it is the monitor. Digitizer is a thin layer that covers LCD that makes digital signals from every finger touch you make. Yes, it is the piece of glass that attaches to LCD or sometimes called LCD digitizer for it was bundle. But literally, we are pointing only one thing—the touchscreen itself. If you like this post, you wanna read more of it. You can check our tech section and leave your comments below. Thank you for reading The Multi-Touch Technology; How Touchscreens Work posted on the website Kwentology if you want to redistribute this article please include the link as the source. Have some kuwento to share? Contact us!